Located at the middle of the Dodecanese, a group of islands at south-eastern edge of the Aegean sea, the island of Kalymnos is one of the loveliest corners among the islands in the Aegean sea. Small as it is, the island is yet certainly not poor of places to visit, beaches for some of the most enjoyable swimming in your life, breath-taking sightseeing, a vast variety of possible day-tours and fine-fine sea-food based kitchen. From the island of Telendos, which you can admire from the Ibiscus Residence balconies or terraces, to the astonishing natural port of Vathi at the exact opposite of the island, our website just wouldn�t be enough to list the variety of places absolutely worth visiting. So just come visit us and choose among the possibility to organize a series of improvised tours or choose among a wide range of organized daily boat-tours available in the island. Enjoy what will probably be of the best fish you�ve ever had (Kalymnos is traditionally known as a fishermen�s island and the fish in the region is considered of the best quality in the whole country!) at the local seafood restaurants, enjoy your drink at any of the plenty bars and live-music pubs and restaurants and just live the experience of one of the most relaxing and revitalizing holiday you could ever imagine having. But that�s just not all!!! 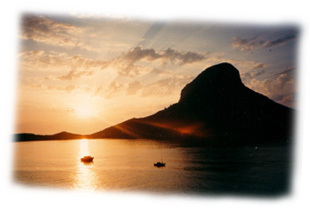 The great advantage of choosing Kalymnos for your holiday is its geographical position. 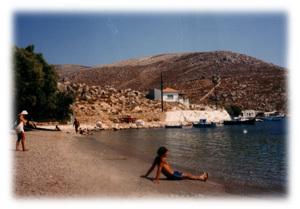 Located very close to so many different islands as well as the Turkish coast, Klaymnos is absolutely the ideal reference point for a combination of day-tour-based holiday which include also other very interesting places besides the island itself, all offering so much to make the trip absolutely worth being done. A day-trip to Pserimos, a tiny island located between Kalymnos and the Turkish coast will let you discover what might as well be the definition of a turquoise-blue sea, as well as one of the loveliest coast-based villages ever seen. A trip to the island of Kos (hardly 40 minutes by boat will allow you to come to terms with its vivid nightlife. 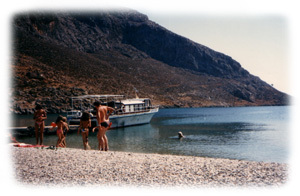 Kalymnos also offers a wide range of boat-daytrips to the Turkish coast at Bodrum and surroundings. And the list of places worth visiting could jst go on and on. From the green island of Leros (an hour trip by boat or ship) to the culturally interesting island of Patmos (don�t forget visiting the St John�s Monastery!) with such a great variety of tour around the island and nearby, a one week or ten days holiday at Kalymnos simply won�t be enough for you to fully enjoy the experience. We guarantee most of our guests do come back in the years that follow their first visit.